For years, patients have been visiting Dental Studio looking for that smile that will bring back confidence lost. Patients complain of missing their smile, hiding their teeth, being embarrassed of the colour, shape or alignment, but also being nervous about the treatment involved in putting things right. We are proud to be offering a new type of treatment that could solve all of these problems without the need for drilling away tooth surface – a beautiful smile using a minimally invasive process – ABB or Align, Bleach, Bond. 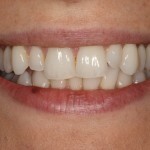 It all starts with Alignment, or tooth straightening! Using one of the invisible straightening systems that we have in place – 6 Month Smile, Invisalign, Lingual Braces or Simpli 5 – we straighten the teeth to the perfect position to enhance your new smile. The second process is the Bleaching – the whitening of the teeth, improving the colour of the teeth by up to 12 shades. The final stage of the smile makeover is the Bonding section, or the placement of tooth coloured fillings on the front of the teeth. 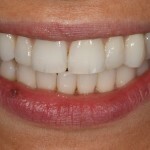 This is less invasive than the placement of veneers, which involves the drilling away of tooth material. These fillings are placed over your original teeth, allowing us to get the perfect shape and shade, without damaging the underlying structure. No need for veneers, no drilling away of precious tooth, just amazing results. We are offering this treatment as a package to our patients – please speak to reception for more information on 02392 254234 or 01243 532992.